Over the last few decades, there have been a few notable jazz-rock duos featuring piano/synthesizer and drums; Weather Report's Joe Zawinul and Indian percussionist Trilok Gurtu's "Orient Express"; Drummer Bill Bruford's duets with Patrick Moraz, and later Michiel Bortslap, (Bruford would also record and perform simultaneously with six pianists in Colin Riley's Piano Circus! ); Happy the Man and Camel's Kit Watkins and Coco Roussel; Marco Benevento and Joe Russo, to name but a few. Following in their footsteps comes "Mehliana", (an amalgamation of their names), featuring keyboardist Brad Mehldau; a fabulous player well known by fans of guitarist Pat Metheny, and drummer Mark Guiliana, who like Russo and drumming legend David Van Tiegham before them, hails from NYC's cauldron of forward thinking percussionists. Mehldau comes to the SF Jazz Center for four nights of music, each one unique; a sold out piano solo show on Thursday, a duet with Kevin Hays on Friday, with Guiliana on Saturday, and a sold out trio show, featuring Larry Grenadier and Jeff Ballard on Sunday. The SF Jazz Center notes that, "Over the past two decades, Brad Mehldau has earned a spot in the jazz piano firmament next to Keith Jarrett, Chick Corea and Fred Hersch as a supremely expressive improviser who turns performances into emotionally wrought journeys. He’s an ambitious composer and adventurous song sleuth, as likely to interpret an atmospheric Bjork tune as a treasured Irving Berlin ballad, at times seamlessly blending the two. An artist whose wide-ranging vision is impossible to sum up in one sentence or performance, Mehldau settles into the SFJAZZ Center for a four-day residency, stretching out in a fascinating array of intimate settings. 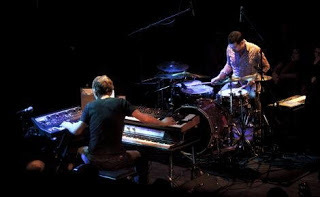 In another and decidedly electrified duo encounter, Saturday sees Mehldau on electric piano and synthesizer, joining forces with the endlessly inventive drummer Mark Guiliana for the west coast debut of their electro-funk Mehliana project. Best known for his long association with bassist Avishai Cohen and his own Heernt and Beat Music projects, the world-funk infused Guiliana has also worked widely with saxophonist Donny McCaslin, vocalist Gretchen Parlato and guitarist Lionel Loueke..."
Mehliana may release an album of the duos work next fall; for those wanting a taste of their music before then, there are plenty of videos and music on the internet, from shows in NYC and London. Like Zawinul and others before him, Mehldau uses his vintage synthesizer in a unique, yet "old school" style, with a gift for using electronic textures I didn't know he possessed outside of his well known, acoustic piano prowess. Guiliana's approach to percussion utilizes an interesting variety of cymbals, in addition to some very subtle, yet extremely complex beats and rhythmic figures. All in all, Mehliana has the all the makings for a fine evening of music this Saturday night.